Before I begin, let me just say – I really really like this cover! The one that is wrapped around my advance paperback is pretty, sure, but the one I’ve used below really catches the eye! OK . . . now to what is between the covers. I LOVE . . . LOVE LOVE LOVE . . . the Harry Potter series. I even love the movies. In my personal opinion, the 8 HP movies are a bright and shining example that once in a while . . . a long while . . . a movie (in this case, movies) can be made right! Yes I know – I got distracted again. I do that. OK . . . WOW! And I really mean WOW! 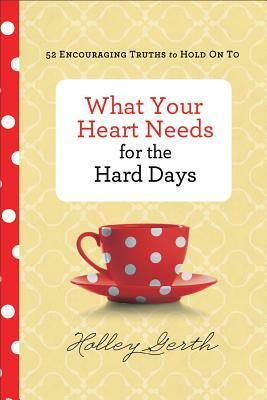 Nicole Rivera has a gold mine in this wonderful devotional! This book has not only given me a new appreciation for one of my all-time favorite book series, it has shown me a wonderful new look into the story behind the story! I don’t know if I ever would have connected all of those dots. Of course, I never saw the Biblical significance in the Narnia stories either – until someone pointed them out to me. That is the brilliance of such stories (or rather – parables). God has truly given Nicole a vision and I am thrilled she is sharing it with the world! Don’t miss Nicole’s further posts about finding faith in the fandoms – HERE! And check out her awesome posts on MUGGLENET.COM too! Here is a short synopsis of the book and the opening letter – which will give you some insight into Nicole’s vision. Finding Unauthorized Faith in Harry Potter. Explore life’s deepest truths. Discover wisdom about friendship, courage, loyalty, and love from the Boy-Who-Lived and his magical friends. Coming December 10, 2015 in ebook and trade paper. 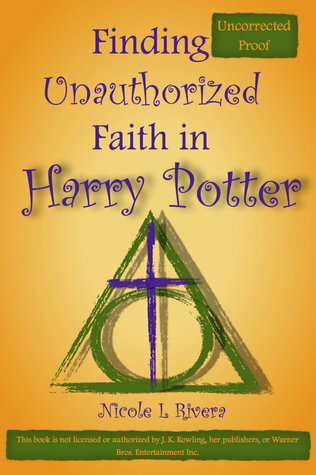 Finding Unauthorized Faith in Harry Potter by Nicole L Rivera, is a Christian devotional especially suited for young adults and all fans of the remarkable series, and for use as in group Bible studies. Nicole reveals the Harry Potter story as a guide to life’s deepest truths, offering inspiration about faith, friendship, courage, loyalty, love, and other wisdom of the Bible. She advises us about how to live like Christ and the Harry Potter heroes. The book is not yet available everywhere but it is available for pre-order at the following retailers: SMASHWORDS, B&N, ITUNES, and AMAZON. Or preorder the trade paperback direct from Hickey’s Books. PLUS – the individual e-books are still available at AMAZON, B&N & ITUNES until we can all get our hands on the paperback compilation. THANK YOU Nicole for allowing me the honor of reading an advance copy of your amazing book! It has blessed me and given me renewed love of the Harry Potter series! One Year of Amish Peace: A Review! 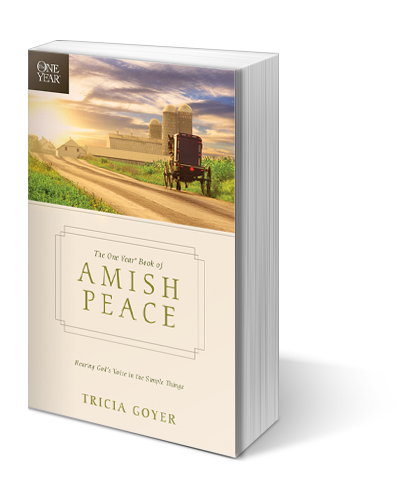 Do you enjoy Tricia Goyer’s Amish novels? Then you’ll LOVE “The One Year Book of Amish Peace”! I entered Tricia Goyer’s promotion a few weeks ago and won a copy of this book. I was so excited when I got an e-mail thanking me for helping to promote Tricia’s book and telling me that I’d won! This book is a MUST for anyone who enjoys Amish fiction! Not only does it answer questions about the Amish lifestyle and beliefs, it offers a wonderful way to connect to that peace in our own busy lives. The pages are filled with wonderful Amish Proverbs, words of wisdom, information and helpful suggestions for ways we can strengthen our relationship with God and fill our lives with his peace and love. In all fairness, I must tell you that I have not read the entire book. It’s a devotional so it’s not meant to be read in a week or two. I have read a single entry each day for almost three weeks now and I went according to the day on the page, so I didn’t start at the beginning. I did however, flip through the pages and read a selection of other – random days. Every one I’ve read has been amazing! Also, while The book is so great – it really needs to be shared, it’s also too good to let go of so be prepared to buy extra copies. I know I will be, if anyone I know needs/wants one. And I do believe this book would make an excellent gift. It is full of inspirational words and information but not one bit of it requires a person to live in the Amish way. (Unless of course that’s your plan… In which case it would definitely give you a lot of insight on what you would be doing/changing.) It does make you wonder though… if it wouldn’t be better in a lot of ways. All in all, an amazing book and an excellent addition to anyone’s devotional time each day. I give this book 10 stars and a huge round of applause! GREAT job Tricia! You can find more info about the book HERE at Tynedale Press, HERE at GoodReads or HERE on Tricia’s own website. You can also get a sneak peek at the book by clicking the link below.